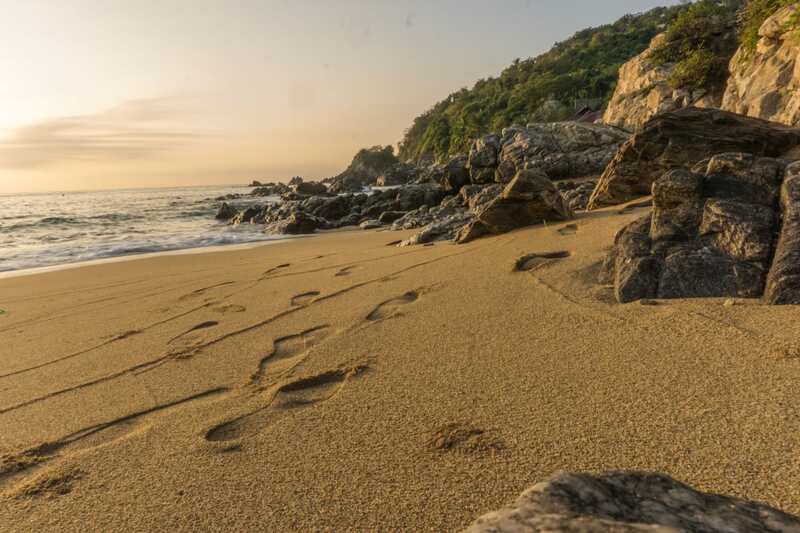 The last time I went to Mexico, I tried to set my foot where no tourist’s foot had ever been set before. Since I was staying almost six months I had time to do so. This December I only had 4 weeks, half of that time was reserved for visiting a friend in Mexico City and a wedding on the Yucatan Peninsular. It left me with only 2 weeks to enjoy Southern Mexico en route from Mexico City to the Yucatan Peninsular. Under these circumstances, taking night buses looked like the right choice. 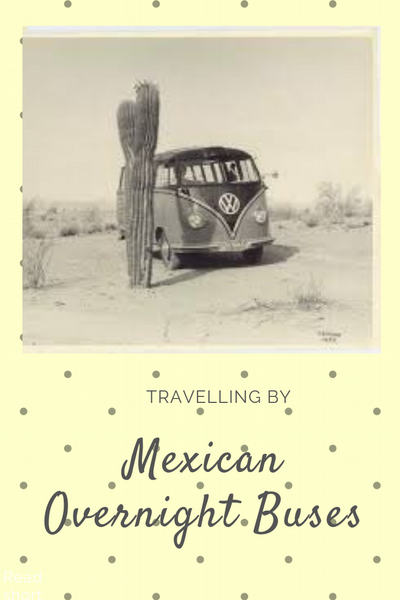 It enabled me to spare some time which I could invest in exploring the beaches, the jungle, the indigenous communities and the colonial towns in Mexicos southern states – instead of wasting half the time on the highways. Even though I sometimes heard otherwise, I may say it was safe. No luggage was lost, no bus was robbed, the roads looked nothing like the death road in Bolivia, where buses fall down the cliffs with tragic regularity. My Mexican friends also said that, from their experience, the Mexican overnight buses are quite safe. Of course, it depends on the class of bus that you take. 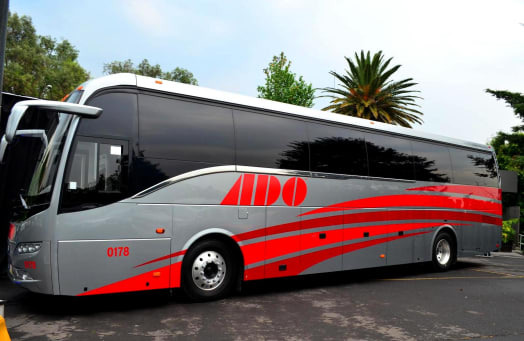 There are 1st and 2nd class buses and a company called ADO has some very fancy buses operating on some routes: ADO gold and ADO platinum. According to this ad travelling with ADO platinum must be almost as pleasant as getting a massage at a spa. We travelled in the 1st class buses and they were pretty much ok. The seats recline, there is a decent amount of space for the feet – yet strangely some coaches had more space than others. There is air conditioning, two TV screens in each bus, where they play a movie or two before it is bedtime. There is a toilet. In international comparison, Mexican overnight buses don´t look anything like overnight buses in Cambodia where you may actually lie down and stretch your legs (provided you are not all that tall), but they are not as bad as Ethiopian ones – blasting loud music, driving terribly slow and full of trash. What are the bus stations like? The first class bus stations are also often called ADO stations (named for their main operator) and they are mostly in a good condition. 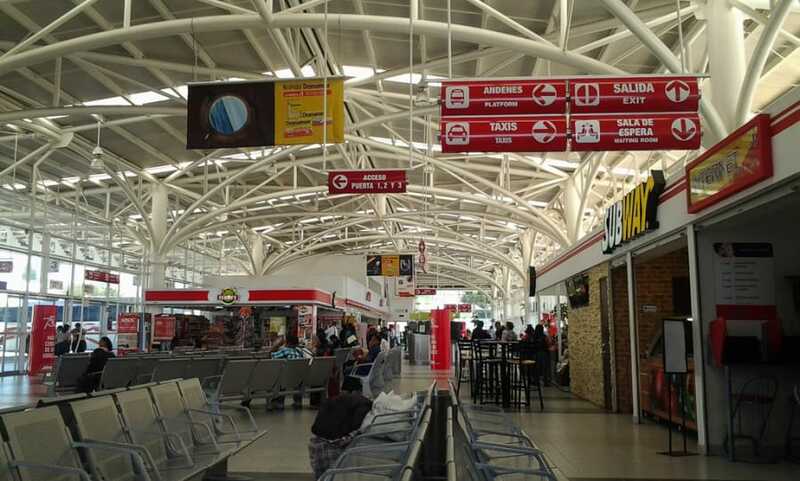 Some have free wi-fi and power outlets (some even for USB), coffee shops and clean toilets. It isn’t dangerous or unpleasant to wait there for a couple of hours if need be. Do the buses operate on time? Yes. All our buses were on time. They actually leave very punctually, once a bus even left a couple of minutes earlier. As a matter of fact, Mexican overnight buses have an advantage over day buses when it comes to departing from or arriving at a big megapolis like Mexico city – at late hours traffic is not that heavy. Well, it is complicated. First, I´ve tried to book tickets online on the ADO website and it didn´t work out as they don´t accept non-Mexican credit cards and in 2018, they didn´t have a PayPal option. Now they do, but apparently they still have some issues with it (see a comment below). You may also try the clickbus website that shows some offers and accepts PayPal – the only bad thing is that they don´t always have the special offers the ADO website has. You might press the “buy now” button knowing that you are missing out on a considerable discount and it leaves you with a bad taste after having bought the tickets. Do you have to book tickets beforehand? Everybody says you don´t have to unless it is Xmas or some other holiday, but do not postpone it until the last hour if you can. When we booked our trip from Mexico to Oaxaca, there were almost no places left 3 days before the trip. Besides, you may end up with the seat next to the toilet on the day of the trip. Buying beforehand also means you can get those special deals we mentioned before – search for “compra anticipada”. Are they rather slow or rather fast? The buses do actually travel rather fast. Unfortunately, the highways that the buses use, often appear like a huge detour compared to other roads that one could find on a map. If you are good at planning in advance it is good to buy as many tickets as possible at once – the more tickets you buy the cheaper it gets! Do not leave your warm clothes in the luggage! It is quite cold in the bus due to air conditioning! You may go to the Carribean coast instead of Merida, there are Mexican overnight buses heading form Palenque to Playa del Carmen or Chetumal. How did you book tickets in advanced if they don’t accept anything other than Mexican cards? Hi Nicole, we booked our tickets through clickbus website https://www.clickbus.com.mx/en/ – they accept Visa, Mastercard and PayPal. ADO site now have Paypal option but do NOT use it! Happened to me and at least one other passenger when we bought tickets online, they gave us tickets with wrong date (the day before that we actually booked). Feels like scam..
Next PostNext 7 (Still) Affordable Destinations in Europe. Hurry Up!